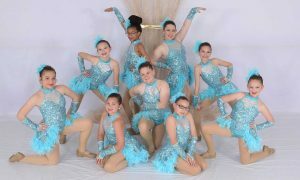 Debby Dillehay Dance Studio Dance is our profession, not a hobby. PRE-SCHOOL PROGRAM classes consist of tap, ballet, and creative movement. Please refer to our “How to Choose the Right Studio” page for detailed information on our pre-school classes. BALLET is a classic dance form with specific terminology, technique, and choreography. The study of ballet serves to enhance technical form, alignment, placement, and posture. It is without a doubt the most important of all dance forms. The ballet barre is the basis for all movement. Here is where the student learns the correct execution of the basic movements and the proper body alignment to carry out these movements. Complete mastery of the body is attained only by progressive training. TAP is a form of dance where rhythmic sounds are created by the feet. It is important to the student because it gives a sense of rhythm, timing and phrasing. It also develops an alert and quick-thinking mind and gives rhythmical coordination to mind and body. JAZZ is a rhythmic stylized dance form conceived in America. There are many different styles of Jazz: musical theatre, latin, rock and hip hop just to name a few. The class consists of a warm up which includes strength and flexibility exercises, jazz work across the floor and/or a center combination each week. Our progressive form of teaching includes exercises for physical toning and strengthening of the body as well as technique and combinations. LYRICAL is a fluid style of dance blending ballet, modern and jazz techniques where the dancer portrays the lyrics of the music and/or tells a story. Lyrical aids in expanding the dancer’s emotion and quality of movement. 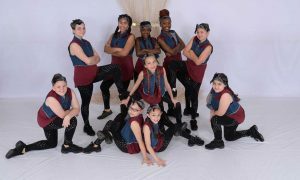 The class consists of a warm up which includes strength, core and flexibility exercises, lyrical work across the floor and/or a center combination each week. 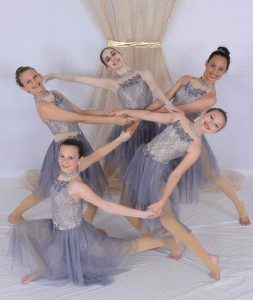 Students who wish to take the lyrical class must have a strong background in ballet and jazz. MODERN dance aids in building a strong center, enhances movement dynamics and contributes to developing a strong inner connection and content to the movements. The class consists of a warm up which includes strength, core and flexibility exercises, modern work across the floor and/or a center combination each week. POINTE is a form of ballet where the dancer dances on the tips of the toes with the assistance of pointe shoes. 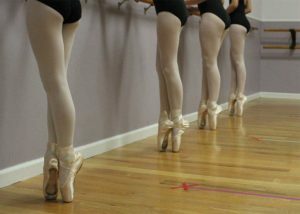 Strict qualifications must be met before being accepted into the pointe program in pointe shoes. The student must have a minimum of three years consistent study in ballet and be a minimum of 11 years of age. The foot is not fully developed before this age and could be permanently damaged by the extra pressure. Student must have good turn-out of the legs, proper balance and body alignment, strong abdomen, back, legs and feet. 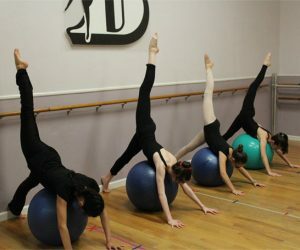 We offer a pre-pointe class for student who would like extra class work to help achieve this goal. This class is done mainly at the ballet barre with across the floor and center work. FLOOR GYMNASTICS the ultimate in strength and flexibility. The beginner starts with simple rolling tricks, cartwheels, etc. Thru progressive training, the student advances to such powerful tricks as back handsprings and aerial tricks. The class consists of an intense warm-up to build strength, style and flexibility, then moves to gymnastics tricks across the mats. HIP HOP uses sharp, energetic, multi-layered isolation’s to facilitate range of motion, dynamics of jazz isolation’s and movement. Hip hop includes high energy street style dance. RESTORATIVE YOGA Restorative yoga is for total relaxation and stress relief. No cardio or sweating in this class. Each pose is held 5 to 10 minutes. Poses are designed to realign your organs. © 2019 Debby Dillehay Dance Studio. All Rights Reserved.